Harold Sydney Hobday (known as Sydney by his family and friends) was born in Croydon, Surrey, on 28 January 1912, the youngest of the five children of Howard and Alice Hobday. After leaving school, he worked for Lloyd’s, the insurance business, in the aviation department. After joining the RAF in 1940, he underwent part of his training in South Africa before qualifying as a navigator in early 1942, and then being commissioned. In the summer of 1942, he crewed up with Les Knight and the others who would form his Dams Raid crew and they joined 50 Squadron in September 1942. 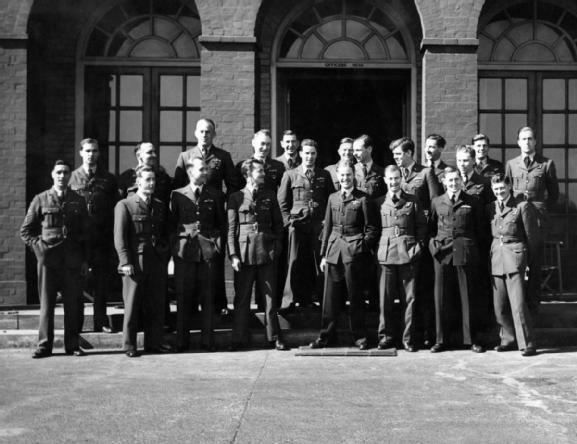 Although some eight years older than his young Australian skipper (still then a Sergeant pilot) they obviously bonded well and flew on some 25 operations together up until March 1943, when the whole crew volunteered to be transferred to the new unnamed squadron at Scampton for the secret mission. One of the reasons the crew worked so well together may well have been its disparate nature. There were the two slightly older Englishmen, Hobday and bomb aimer Edward Johnson. Ray Grayston was also English but Bob Kellow, the wireless operator, was Australian and both the gunners, Fred Sutherland and Harry O’Brien were Canadians. All of them shared the highest regard for their young pilot. As one of the most competent crews it was no surprise that they they were chosen for the first wave on the raid, and they made their mark with the outstanding airmanship needed to deliver the final breach of the Eder Dam. On their return to Scampton, Hobday took part in the celebrations with a fair degree of gusto. He was in the group photographed outside the Officers Mess around breakfast time on the morning after the raid, but fell asleep sometime later and regained consciousness at 1300, slumped in an armchair. He was awarded the DFC for his work on the raid and attended the investiture at Buckingham Palace and the party at the Hungaria Restaurant the same evening. On the night of 16 September 1943, when Knight ordered the crew to bale out after the aircraft was badly damaged over the Dortmund Ems canal, Hobday managed to evade capture. Within a few hours he had made contact with Dutch resistance supporters. He was taken to a woodland shack near Baarn and reunited with his colleague, Fred Sutherland. The pair were then fed into the escape network, and smuggled the whole way through France to the Pyrenees, then onward through Spain to Gibraltar, and then returned to the UK. After the war, Hobday returned to Lloyd’s and eventually became head of the aviation department. He married Ethel Simpson in 1938, and they had four children. He died in Fakenham, Norfolk, on 24 February 2000. Terry — try the Imperial War Museum photographic collection : http://www.iwm.org.uk/collections/ . Search for Operation Chastise. I had the pleasure of meeting Harold Hobday a few years before he died and feel privileged to have spoken to and shared a laugh or two with a very modest gentleman. He spoke of the raid as a routine operation, which was testament to thier training. He navigated AJ-N to the Eder Dam and back home with no error. He was much more interested in talking about his escape through France and Spain after his Lanc crashed over Holland and that he was the last member of the crew to see Les Knight as he kept the aircraft steady for him to bail out. His journey took several months and all that time his wife thought the worst. I met a hero from famous story and a very real man. I remember Sidney Hobday from before the war and I well remember him showing us the piece of silk from his parachute when he landed in a tree and the tales of his epic journey back to UK. What a hero! He was so modest about it. I remember Sidney well. He was a friend of my parents and we had holidayed with him and his wife Ethel. I remember him coming home and rhe excitement. Very nice to hear so many people have good memories of my father you all probably know more then me as my father never really told us much about the raids. If the Dambusters were ever mentioned he would tell me it was his job and I believe thats how he dealt with the war. He was a good man and I’m proud to be his son. Good to see the comments about your father on the Dambuster blog. As a distant relation I have always been interested in his wartime experiences. Do you have any more details of his wartime operations with No.50 Sqdn. prior to the dambusters raid ? My sentiments exactly! ‘Hobby’ and my father were proud of their efforts and good friends throughout and thereafter. Only in recent years have I begun to piece together the mass of wartime information left to me and inherited in trust for my family. Hello John. My name is Richard Woolderink, writer of the book Raalte during wartime 40-45. Your father is included in the book with the story that he got help in Raalte and pretended to be deaf and dumb. The first print was publishedd in the en of 1986 and the second eraly 2003. My e-mail is wolde313@planet.nl… Would like to get in touch. Hello John. My name is Richard Woolderink, writer of the book Raalte in oorlogstijd 40-45. First print published 1986, second in 2003. In the book I wrote a little about your father because I had a copy of a report that he passed from Hellenddoorn to Raalte and got here a train ticket to Baarn. Next year 2020 we celebrate 75 years of liberation / freedom. And from many media requests come in for stories and photographs. I would very much like to find traces in Raalte to find out who helped your father over here. The book in Dutch I can sent you as pdf-file. My mail is wole313@planet.nl I hope to get in touch. Thank you for tasking your time to reply to me.